Very, very quietly lest Mom hear the banned music. Back and forth, back and forth across her backside. As she taught us the Twist. Flailing my sun-pinked arms like a gawky flamingo. Danced through her youngest child. Thanks to WordPress for this very fun Daily Prompt. Do you have early memories of dancing? There comes a time when you feel you should stop talking about your grief. Your friends must be sick of it, right? But then someone else dies. You’ve pledged not to write one more blog post about death and grieving for fear that you’ll start losing your readers. But someone else has died. You might even have recently had a grand spiritual epiphany of the type engendered only by great suffering, and you may now understand at your core that we are all one endless love and that there is no death. But – someone else has died, and although all that love stuff is very nice, they’re still gone. So it is with apologies that I bring you news of another death in this blogger’s life. The third in eight weeks. 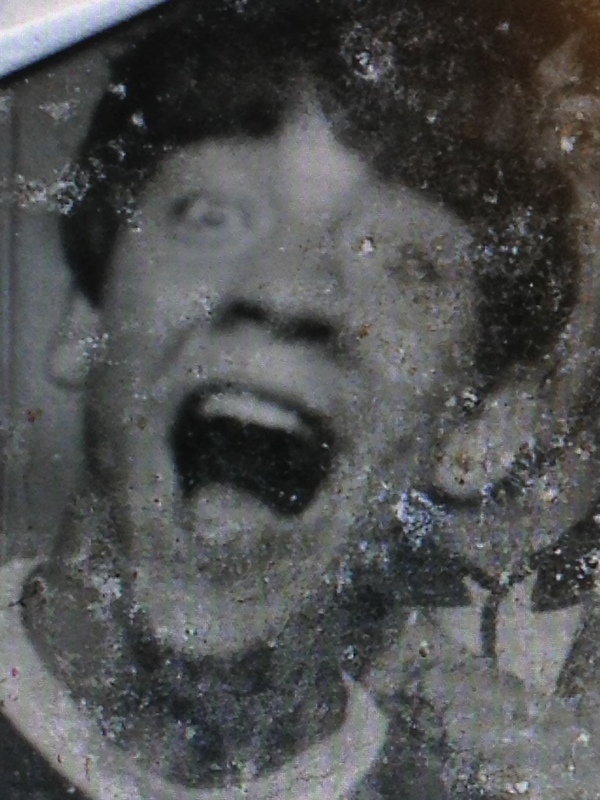 Steve was not a dear and intimate friend as were my brother and Betsy. In fact, you couldn’t trust Steve any farther than you could toss a keg of beer. He had issues, to put it kindly. By the time he moved into my best friend’s house next door when I was eleven and he was twelve, he had already been in something like eighteen different foster homes. A smart survivor, he had learned to manipulate, scam, and in my case, charm. Charmed doesn’t come close to describing the crush I had on Steve for seven years, which is longer than any actual relationship I’ve ever had. Steve and I used to hold hands beneath our jackets in the backseat of his foster family’s Plymouth as we rode to church each Sunday. He was the first boy I ever kissed, the first boy I ever slow danced with, the first boy whoever clambered awkwardly on top of me as we ventured into adolescence (which scared me so badly that I fled the house with him in hot (pun intended), apologetic pursuit. Steve had hurting blue eyes, the kind that told you he needed to be saved and that you were just the girl to do the saving. I’ll never forget the first time he winked at me when we were watching Superman and eating Hostess Twinkies after school one day. I thought I would die. I thought he had died one New Year’s Eve in the mid-seventies. He called from New York to tell me had swallowed a bunch of pills and he wanted to say goodbye. He passed out on the phone — I called the New York City police and tried to find his sister in directory assistance, but there was nothing I could do. I didn’t know where he was. Ten years later, he showed up in Maryland and I told him he could stay on my couch as long as he didn’t drink. We spent three sweet but sad days reminiscing together before he disappeared. When I last saw Steve, his soft, china-doll skin with the downy peach fuzz had been rendered lined and leathery by years of homelessness. 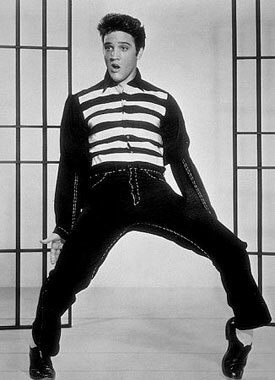 The thick dark hair that his foster mother used to fashion into a perfect Beatle cut by clipping around a bowl on his head had mostly fallen out, and his full Elvis lips had grown thin and hard after God knows how many prison stays. Everyone thought that Steve was turning his life around when he visited us a few years ago. He had been sober for a year and was finally allowed to see the grandchildren his daughter had kept away from him during “the bad years.” He told me maybe we would get married at last, and we both laughed. He told his foster mother she was the only real mom he had ever had, and we all got teary and hugged a lot. It was the first time that his foster family and I had seen him in twenty five years. He was happy. When his foster mother passed away a year after his visit, I was charged with trying to find him again. I did, with Google. It was a recent mug shot taken when he was arrested for soliciting prostitutes. He did not look sober. I never told Steve or anyone else about my discovery. Why not let people believe the best? He came to his mother’s funeral and we all hugged some more. Steve’s secret is safe here — he read my blog, but nobody else in his family does. He died in his sleep. His sister said he had strep throat. We don’t yet know for sure what happened, but my guess is that the autopsy won’t be keeping any secrets. Rest in peace, beautiful boy. You will always hold a special place in my heart. OK, so maybe you don’t want to hear what a busy weekend I had, and how I just had to rest on Monday so I could fully engage with the other six days of the week that I don’t work. I know it’s obnoxious to say, but five years into my “sabbatical” from the work-a-day life, I still like Mondays best because everyone else is headed back to work. But hey, I worked full-time for thirty-four years, and I’ll have to work again unless I become a famous author. I took off yesterday. I was tired. Get over it. Go to the gym. It lifts your spirits, plus you feel virtuous even if you don’t do bupkis for the rest of the day. But don’t get weighed and measured because you might find out that you have gained three pounds in a month and put on several inches in the process. Also, your body mass index might resemble that of a slab of cheddar cheese. But you can always explain to the coach that your brother died and you are grieving and so you’ve been eating too much. Friends have been taking you out to eat a lot, and you need to have two pieces of cinnamon toast with butter every night because that’s what your mother always gave you when you were sad. Take a long bubble bath with an excellent new book. Mine is a collection of writings called Spirituality, Contemplation, and Transformation. But don’t stay in the tub for an hour and forty-five minutes or you might almost miss the grocery store. Then you wouldn’t be able to buy a bunch of healthy organic kale, zucchini, and apples and then come home and eat left-over pizza for dinner. Write, write, and write. In your journal, for your blog, and for an upcoming anthology that you hope will facilitate your authorial fame. Write all day instead of paying your overdue bills or your deceased brother’s overdue bills. Don’t put off paying his bills till evening, though, or you might decide that would be too depressing right before bed and instead go back to reading your book. Which would mean you would have to make a snack, like say, cinnamon toast with butter. Make lists! Get organized! Make lists of daily tasks, weekly tasks, and monthly goals. Put them on a nifty dry erase board using different color markers. Devote plenty of time to deciding which color is appropriate for each task. Your new iPhone has lots of fun ways to waste time get organized, too. If you spend enough time making lists, you can achieve a sense of accomplishment without — well, you get my point. Don’t, under any circumstances, get on Facebook. And if you accidentally do so, don’t spend hours in virtual conversations about Bob Dylan’s Superbowl-advertising-sell-out to the auto industry, people’s use of plastic versus reusable bags, or the history of using one or two spaces after a period. With my friends, this can take the better part of an afternoon. Still, you might decide it’s worth the time when you come across a friend’s post saying that she just discovered her little boy doing his first Google search: “How to bild a growing up mashine.” This made my day. 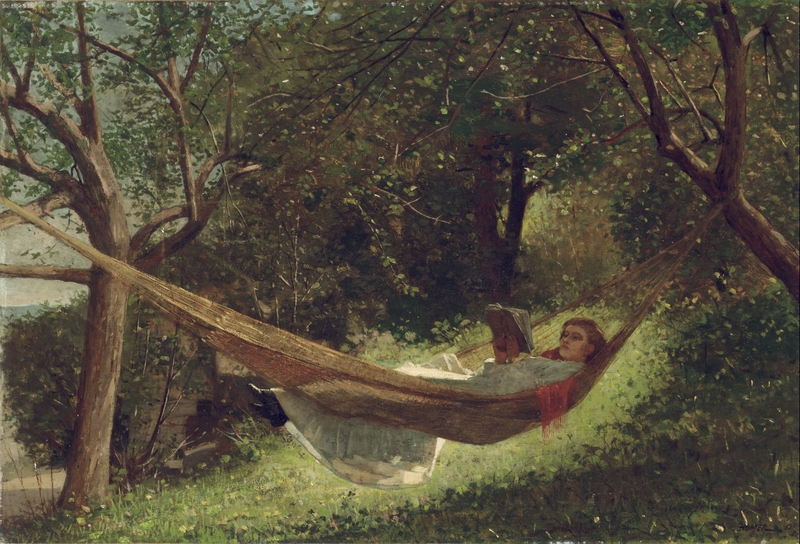 Artwork: Winslow Homer, Girl in the Hammock. Wikimedia Commons. One to her hostel, one to his hotel, one to the train station. “You sure you know where you’re going?” asked the last one. From a distance, to an American, they all look pretty much the same. And it made me want to laugh and cry at the same time. Oh, the roads it’s traveled, the stories it holds! This week’s Photo Challenge asks that we use a tangible object as inspiration and subject. 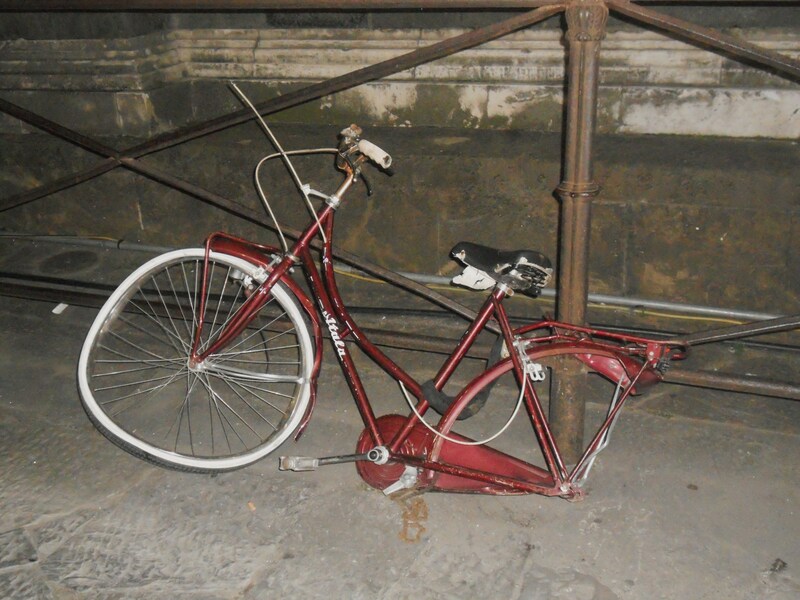 Give yourself permission to escape the mundane for a minute and imagine one of the stories this bicycle holds!